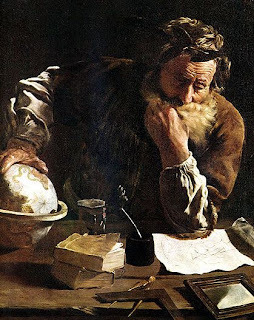 Archimedes was a great mathematician, physicist, engineer, inventor, and astronomer of his age. But generally, he is considered to be the greatest mathematician of antiquity and one of the greatest of all time. . His contributions in geometry revolutionised the subject and his methods anticipated the integral calculus 2,000 years before Newton and Leibniz. He was also a thoroughly practical man who invented a wide variety of machines including pulleys and the Archimidean screw pumping device. He was born 287 BC in the seaport city of Syracuse, Sicily. He was the son of Phidias who was an astronomer. Though he had many great inventions, Archimedes considered his purely theoretical work to be his true calling. His accomplishments are numerous. Unhappy with the unwieldy Greek number system, he devised his own that could accommodate larger numbers more easily. He invented the entire field of hydrostatics with the discovery of the Archimendes’ Principle. However, his greatest invention was integral calculus. To determine the area of sections bounded by geometric figures such as parabolas and ellipses, Archimedes broke the sections into an infinite number of rectangles and added the areas together. This is known as integration. He also anticipated the invention of differential calculus as he devised ways to approximate the slope other discoveries in geometry, mechanics and other fields. Archimedes was killed by a Roman soldier while participating in a war.